Each city in any part of the world has something to be proud of and what makes it an exceptional setting it apart from any other places. The Cuban metropolis of Havana is no exception and has so many of such mentioned places and beauties. For sure, hardly anywhere you could find a place like La Bodeguita del Medio, a place with such a rich and long-life history linked with influential figures, located in the middle part of Empedrado street, connecting a colonial part with a newly built-up Havana centre. It is said that La Bodeguita is located exactly a hundred paving bricks away from the Havana Cathedral, the most monumental american baroque building in Cuba. 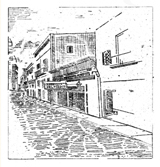 According to its half-way down the street location at 207 Empedrado street, the Inn was given its extraordinary name of La Bodeguita del Medio, what in a free translation means the Pub in the middle of the street. This might sound a bit strange in a matter of traditional marketing phylosophy when choosing the right place for opening a new business, as the most common strategic place is usually chosen somewhere on the street corner to be well recognized for people passing by. When entering La Bodeguita interior in Havana, first thing you recognize is an intensive breathtaking scent of cuban mint and a mixture of herbs that positively influence and treat your digestive system. 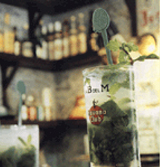 That is why these amazing ingredients became a part of such a well-known traditional MOJITO drink, which of the full-bodied taste had gone through an exciting transition as time went by. In the background of La Bodeguita you can enjoy exceptional and the most temting selection of meals and delicacies while being pulled into the atmosphere of cuban melodies performed by a local cuba hot-blooded trio spreding all over the interior. Let´s get back into the war times of past century, into 1942, when Mr. Angel Martinéz Borroto let himself be led by his own business intuition and he made the decision to buy a tiny little store in Empedrado street, at those times located in a fortified part of historical Havana, and he started his little business called La Casa Martinéz. Right afther that, Felito Ayón, a very close friend of Martinéz, opend his own printing shop, not so far from La Bodeguita. 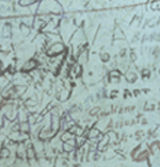 As he didn´t have his own telephone, Ayón´s clients used to visit La Bodeguita to make phone calls. This was of course a good reason to enjoy a nice glass of rum every time they visited this cosy place. One of the most famous guests of La Bodegiuta, among many others was Nikolas Guillén, a classical cuban poet, as well as Alejo Carpentier, a famous novelist. As the time went by, La Bodeguita became a very remarkable and favourite place for intelectuals and artists of all kinds and not less for common Bohems. We can proudly acclaim that La Bodeguita became an exclussive place for advanced thinking latin-american intelectuals and artists coming from all over the world. At the beginning, the La Bodegita life and happening was focused at the bar. Later on, Martinéz´s wife, also called Armenian thanks to her ancestry, started to prepare little somethings and snacks to enjoy with a drink. The main daily meal used to be CONGRÍ, a combination of black beans served with white rice, also described as „Maur and Christians“ food. She also served Masas de puerco fritas,fried pieces of pork and Tastanes de plátano, which were fried banana crisps or little banana pancakes. This was the way how Martinéz tried to meet his guests´requirements, but he was generous indeed as for being paid only for serving drinks. 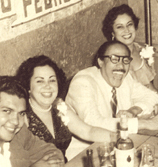 In 1950, Martinéz renamed his Inn from La Casa Martinéz to La Bodeguita del Medio, as this was actually a name the regulars tagged it with and had got to use it for a long time. In the 50´s of the last century, La Bodeguita was an inportant place for social and cultural life for many famous people from all over the world such as Nat King Cole, an american singer, Ernest Hemingway, the Nobel prize winner for literature, also Brigitte Bardot, known as an idol for women all over the world as well as a beautiful italian actress, Sophia Loren, and not forgetting to mention names such as Spence Tracy, an american actor, Errol Flynn, Austin Lara or Mario Moren. All these famous icons including top-class cuban intelectual attracted more and more enthusiastic faithful visitors in La Bodeguita. Nowadays, La Bodeguita del Medio remains a never-dying memorandum for arty past of Old Havana as it still keeps its high standards for intelectuals, politics and it does not stay unnoticed for people passing by and walking down the streets of Havana. Many La Bodegita visitors say this monumental building from the 19th century keeps the most valuable collection of signatures, amazing memories and photographs from all over the world on its interior walls. This extraordinary fact was supposed to be awarded and nominated for being written in a Guinness world records book.